Its construction runs against the principles of international law. The Ukrainian Foreign Ministry has protested against the opening of the Kerch bridge linking mainland Russia and occupied Crimea. It said that Russia had built it illegally and without Ukraine's consent, the ministry's press service has said. "The Ukrainian Foreign Ministry expresses its resolute protest against the opening of the bridge across the Kerch Strait and once again emphasizes that Russia has built this infrastructure facility illegally and without Ukraine's consent," the statement reads. The Foreign Ministry said that Russia's actions fundamentally contradict the common norms and principles of international law, blatantly violate the 1982 UN Convention on the Law of the Sea and its bilateral commitments to Ukraine. Considering Russia's armed aggression against Ukraine and the annexation of Crimea, the Foreign Ministry interprets these actions as an attempt to legitimize the annexation of a part of Ukraine's sovereign territory. "The construction of the bridge, just like any other actions by the Kremlin occupying authorities, cannot change the status of the Autonomous Republic of Crimea and the city of Sevastopol as an inseparable part of Ukraine within its international recognized borders," the statement reads. As an occupying state, Russia carries full responsibility for any consequences of its international illegal actions and for the harm they may have inflicted. 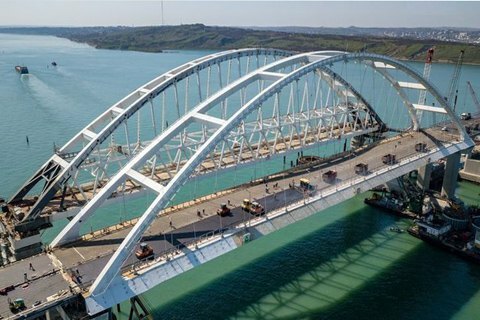 Ukraine continues consistent efforts to secure an expansion of national and international sanctions against individuals and legal entities involved in the illegal construction of the Kerch bridge. Russian President Vladimir Putin came to Crimea to attend the opening of the Kerch bridge today.